A beautiful film of the scenic area around ÉMéiShān and LèShān Dàfó, SìChuān province. Mount EMei is one of the Four Sacred Buddhist Mountains of China on which there are nearly 70 Buddhist monasteries. At 71 meters (233 feet) in height, LeShan Giant Buddha is the largest stone Buddha in the world. The LeShan Giant Buddha 乐山大佛 is located in SiChuan province and is a 233 foot tall stone statue constructed during the Tang Dynasty. Emei Shan (3,100 meters / 10,200 feet) is one of the four Chinese Buddhist sacred mountains. Emei Shan is UNESCO World Heritage Site (together with the Leshan Giant Buddha) : "...an area of exceptional cultural significance as it is the place where Buddhism first became established on Chinese territory... The first Buddhist temple in China was built on the summit of Mount Emei in the 1st century CE." The Giant Buddha, which is around 70 meters in height, was carved out from the hill during the Tang dynasty (618–907). It took 90 years to complete. The LeShan Giant Buddha is part of the Mount Emei Scenic Area, which is a UNESCO World Heritage Site. This area has exceptionally diverse vegetation, ranging from subtropical to sub-alpine pine forests. Over time, additional temples established nearby making this an important place in Buddhism. There is a lot to see and explore. PLEASE DONATE to this site - we really need your help to keep going; see the donate button on the right. A UNESCO World Heritage site. The first Buddhist temple in China was built here in SiChuan province during the 1st century A.D. in the beautiful surroundings of the Mount Emei and in view of its peak. 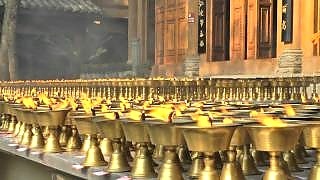 Over the centuries, the addition of other temples turned the area into one of Buddhism's holiest. 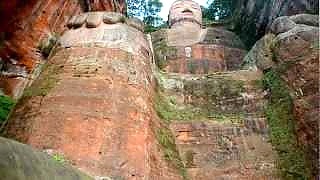 The most remarkable - the Giant Buddha at LeShan - was carved out of a hillside in the 8th century and looks down on the confluence of three rivers. At 71 meters in height, it is the largest Buddha in the world. 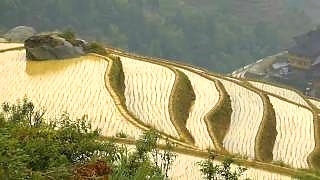 In SiChuan province. 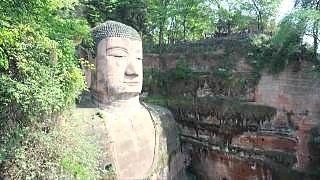 The Giant Buddha, which is around 70 meters in height, was carved from the cliff face during the Tang dynasty (618 - 907). It took 90 years to complete. At 3,100 meters (10,170 feet), the nearby Mount EMei is the highest of the four sacred Buddhist mountains in China and a UNESCO World Heritage site. This statue was carved into rock during the Tang Dynasty (618 - 907). 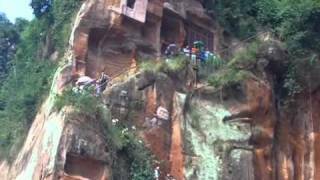 It is situated in SiChuan province near the town of LeShan. The stone sculpture faces Mount Emei, with a river flowing below the Buddha's feet. At 71m in height, it is the largest carved stone Buddha in the world. The Mount Emei Scenic Area, including Leshan Giant Buddha Scenic Area, was listed as a UNESCO World Heritage Site in 1996.